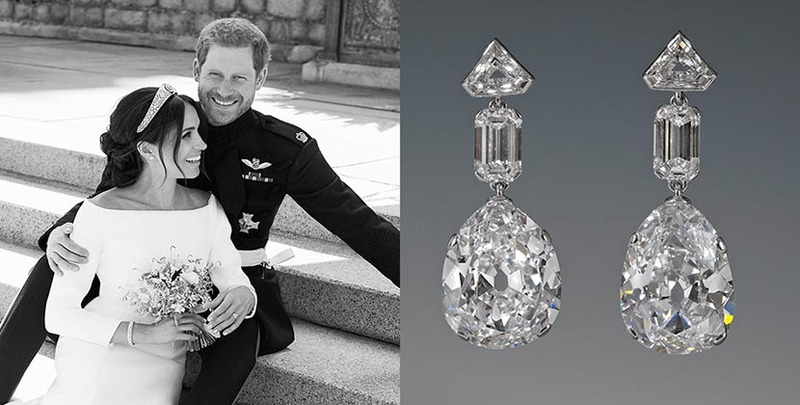 So how did I know Meghan Markle was going to wear her new diamond and white gold Galanterie de Cartier studs on her wedding day? Friends, family and colleagues have been asking me ever since the royal wedding. Cleary I didn’t know for sure, but I predicted she might for a few reasons and wrote about it in a story over a month ago. The first easy giveaway was the fact that the metal was white as opposed to her usual yellow or pink gold pieces. The slight formality of the jewels was another clue. The fact that they were new, obviously a wedding gift, meant they could play the traditional role of her “something new.” The other huge hint for this jewelry historian was that they were from Cartier. For well over 100 years the British Royal Family has worn designs from the French jeweler on special occassions. The relationship with the British Royal Family started around 1902 when Cartier opened a branch in London at the time of the coronation of Edward VII. Jacques Cartier and his brother Pierre both worked in London during the year of the coronation to be on hand for all the demands of the VIP guests in need of diamond tiaras and other major jewels for events. Jacques moved to London permanently and like his brother Louis in Paris and Pierre in New York thoroughly understood the taste of the local clientele. In 1904, King Edward VII rewarded Cartier’s good work and gave the firm a royal warrant, a fancy way of publicly saying he had happily shopped at the establishment. One of the things he may have bought was Queen Alexander’s platinum and diamond collier résille necklace, a grand bib style jewel she wore regularly. Over the years the royal family has continuously shopped at Cartier. They have also received several gifts by Cartier from royalists. 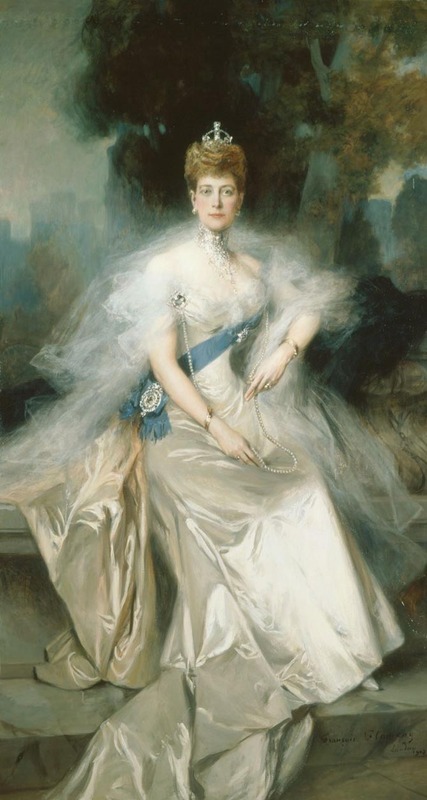 The Cartier jewels from the London boutique chosen for and purchased by the royals, in the beginning and to this day, are mainly elegant diamond jewels. It is a different Cartier style than the colorful imaginative looks Cartier in Paris became famous for in the early years of the twentieth century. The extraordinary jewelry collection Dame Margaret Helen Greville bequeathed to Queen Elizabeth’s mother in 1947 had several magnificent Cartier jewels including two pairs of Art Deco diamond earrings. The Greville Chandelier Earrings, composed of platinum and array of fancy-cut diamonds, where given to Queen Elizabeth II by her parents as a wedding present in 1947. 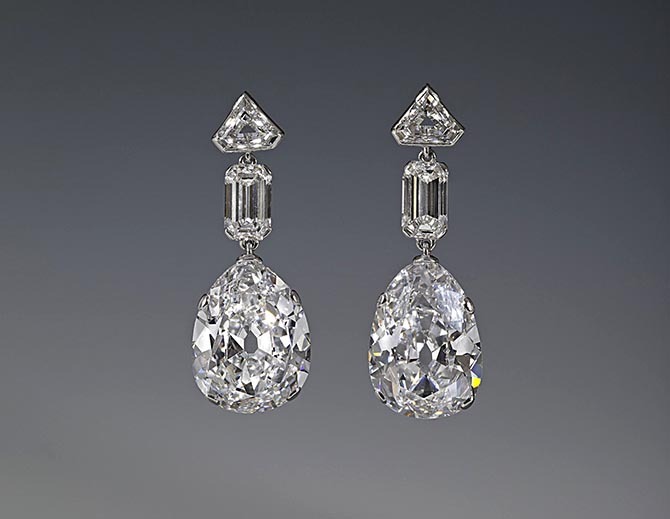 The Greville Peardrop Earrings, made by Cartier in 1938, are composed of platinum and diamonds including two pear-shape diamonds weighing around 20-carats each. The Queen inherited the jewels in 2002. One of the most extraordinary fancy colored diamonds in the Queen’s collection is set in a Cartier jewel. In 1947 the Queen received a 54.5-carat rough diamond from Canadian geologist Dr. John Thorburn Williamson as a wedding present. Six years after the gem was cut into a 23.6-carat round brilliant by Briefel and Lerner of Clerkenwell, she took it to Cartier. 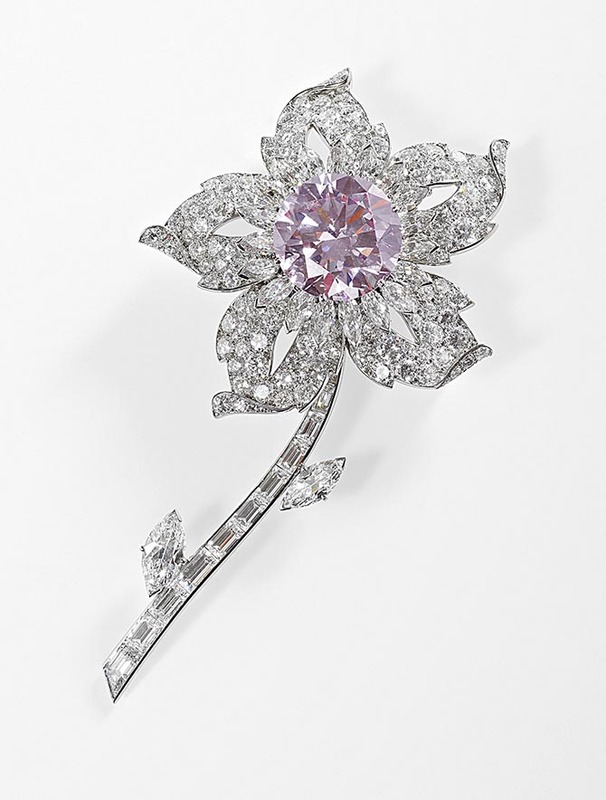 One of the firm’s esteemed designers, Frederick Mew, conceived the jonquil diamond and platinum flower brooch for the pretty pink. The Queen has worn the brooch to the weddings of The Prince of Wales in 1981, Lord Linley in 1993 and Prince Edward in 1999. 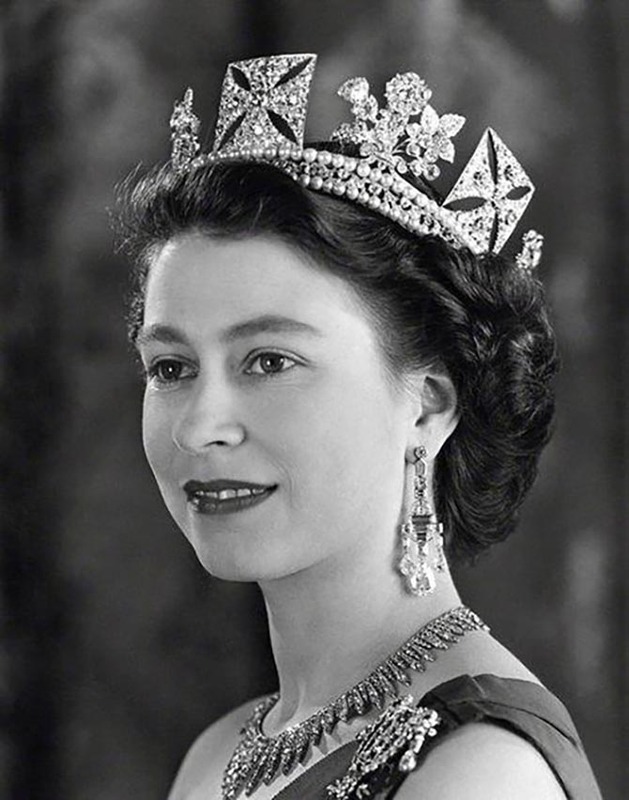 The Art Deco diamond and platinum Halo tiara, certainly the most famous piece of Cartier in Queen Elizabeth II’s jewelry box today, was purchased in 1936 by King George VI as a gift for Queen Elizabeth I. The jewel was given to Queen Elizabeth II, when she was still a princess, as an 18th birthday present in 1944. 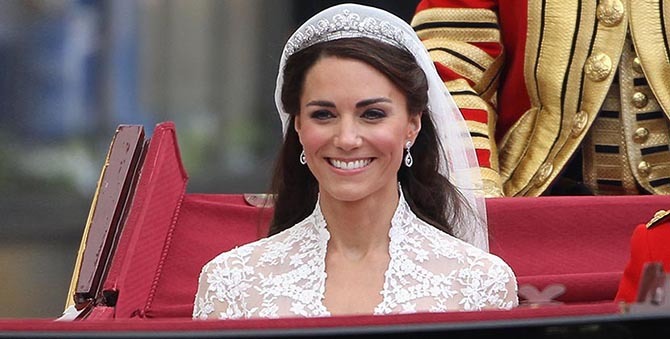 Over the years, the queen has loaned the tiara to her sister Princess Margaret and her daughter Princess Anne as well as, of course, her granddaughter-in-law Kate Middleton more properly known as Catherine, Duchess of Cambridge for her wedding in 2011. 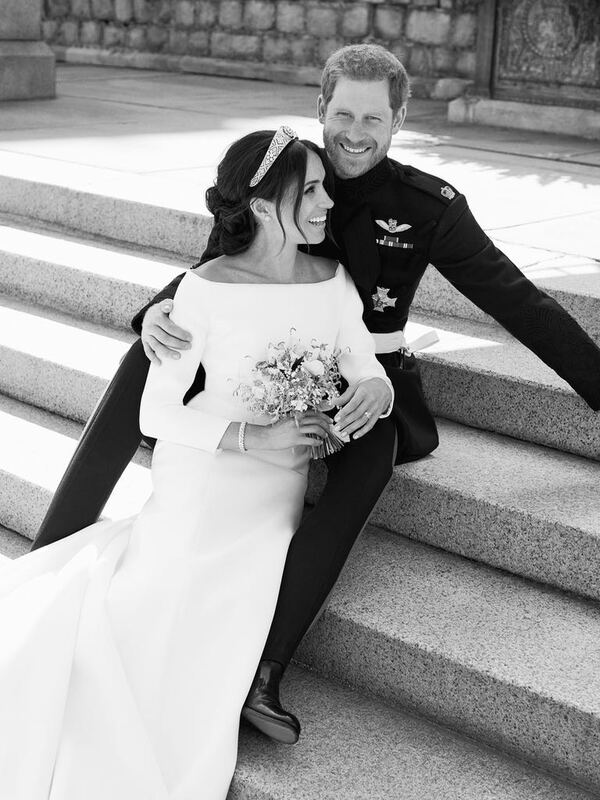 Meghan Markle received more Cartier wedding presents than the Galanterie de Cartier studs she began wearing over a month ago. For the ceremony, she had on a stunning statement Reflection de Cartier bracelet of brilliant and baguette-cut diamonds. 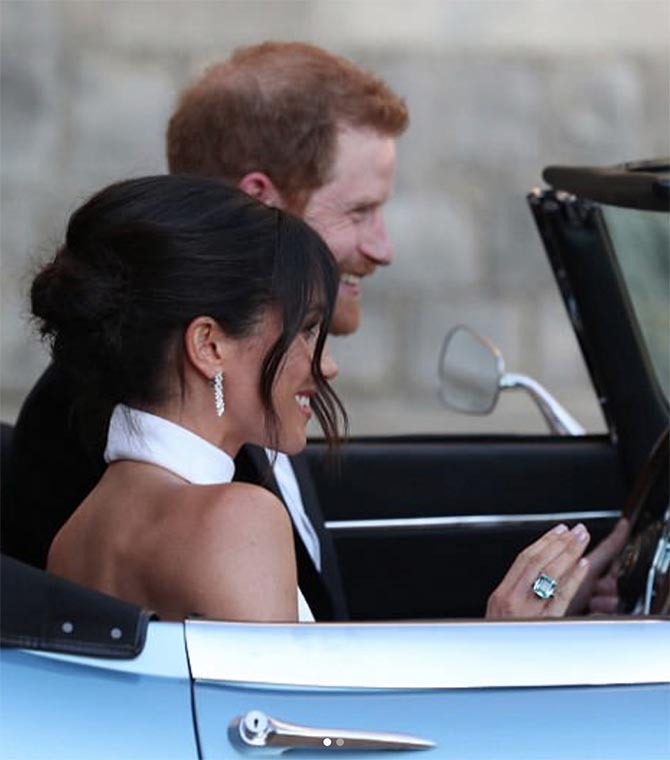 For the evening reception on her wedding day, Meghan wore a third Cartier jewel along with Princess Diana’s aquamarine ring. The Reflection de Cartier earrings were from the same collection as her wedding day bracelet. While the general consensus among royal watcher is that the statement pieces were a gift from Prince Charles, the facts have not been confirmed. What is clear is that the British Royal Family still appreciates Cartier. Has Meghan Markle Debuted Her Wedding Earrings?